The Millennium Development Goals, adopted at the UN Millennium Summit in 2000, are the world's targets for dramatically reducing extreme poverty in its many dimensions by 2015�income poverty, hunger, disease, exclusion, lack of infrastructure and shelter�while promoting gender equality, education, health and environmental sustainability. These bold goals can be met in all parts of the world if nations follow through on their commitments to work together to meet them. Achieving the Millennium Development Goals offers the prospect of a more secure, just, and prosperous world for all. The UN Millennium Project was commissioned by United Nations Secretary-General Kofi Annan to develop a practical plan of action to meet the Millennium Development Goals. As an independent advisory body directed by Professor Jeffrey D. Sachs, the UN Millennium Project submitted its recommendations to the UN Secretary General in January 2005. � The core of the UN Millennium Project's work has been carried out by 10 thematic Task Forces comprising more than 250 experts from around the world, including scientists, development practitioners, parliamentarians, policymakers, and representatives from civil society, UN agencies, the World Bank, the IMF, and the private sector. 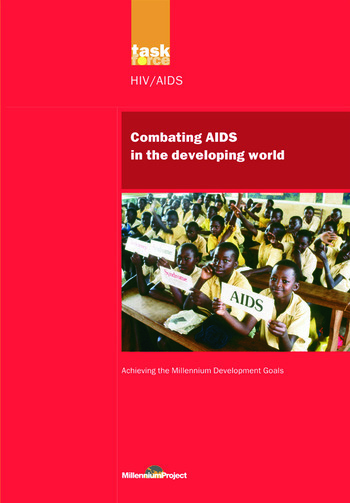 This report lays out the recommendations of the UN Millennium Project Task Force 5 Working Group on HIV/AIDS. The Working Group urges the intensification and revitalization of prevention efforts, a stronger focus on vulnerable populations, and the expansion of antiretroviral therapy to reach 75% of those in need by 2015. Simultaneous expansion of prevention and treatment, accompanied by sustained investment in health systems, will enable countries to reverse the spread of HIV by 2015. The Millennium Projecct was commissioned by the UN Secretary-General and sponsored by the United Nations Development Group, which is chaired by the Administrator of the United Nations Development Programme. The report is an independent publication that reflects the views of the members of the Task Force on HIV/AIDS, Malaria, TB, and Access to Essential Medicines, who contributed in their personal capacity.